Enjoy a fantastic stay, continental breakfast and a glass of prosecco from just £79. There's an array of great deals and rewards for guests who book in advance online. Spend a lovely night in the Malmaison hotel with your partner with a bottle of champagne, a 3-course dinner and a night in a slinky luxury hotel, followed by breakfast the next morning. Where do I use my Malmaison voucher code? "For popular hotels, book as far in advance as possible for stays during peak periods. During off-peak times waiting until the last minute is far better as rooms sell for a reduced price rather than not at all." Malmaison lay their name to their range of boutique hotels, each with their own unique and uncompromisingly character, in specially selected city locations across the UK. You’ll find a Malmaison hotel in pretty much every city in Britain including Birmingham, Oxford, Edinburgh, London and the North West like Manchester and Liverpool. In each hotel, you’ll find stylish rooms and suites with gorgeous décor, comfy beds, power showers and digital TV. Although style and quality remain present throughout each Malmaison hotel, character and setting change dramatically as you move from location to location. In London, you’ll find a Malmaison in an area synonymous with an understated 1970s vibe, with interior and decor perfect for design lovers and cosmopolitan drinkers. In Scotland you’ll find a Malmaison in a prime location; a vibrant gem amidst the granite City. Here you can enjoy big beds, sublime food and drink, a spa and a brasserie filled with Scottish inspired delicacies. Every other Malmaison varies in interior and exterior but guarantees a blissful stay. So, if you want to stay in UK cities in style choose none other than Malmaison. Malmaison set themselves apart from other boutique hotels with their superb brasseries and bars. In each Malmaison Brasserie, you’ll find ceaseless wine lists and plenty of fresh food which you can indulge in as you sink back into a comfortable booth and warming decor. Mal Brasserie is where fresh ingredients meet fresh thinking, as their expert chefs serve up iconic dishes with a Mal twist, that’ll leave you wanting more. Brasseries in each Malmaison hotel have different dining options- you can browse each menu on the Malmaison website. As well as an a la carte menu and a Sunday Lunch special, Mal Brasserie's also have plenty of alcoholic beverages and succulent cocktails for you to enjoy with your dining companions. The Malmaison spa provides a deeply relaxing day for those who need time to unwind and recharge. At the Malmaison Spa, you can choose from a variety of experiences and treatments. There’s everything from the short and soothing quick fixer to the all day escape. You can handpick treatments, for him and for her, that target your body, face, hands, and feet. You can even undergo waxing at the spa to make you feel refreshed and brand new after your replenishing day. Find your inner peace with rejuvenating, healing experiences like hot stone massages, pre or post natal massages, age defying facials and life-saving back treatment. To top the day of indulgences off you can even enjoy afternoon tea before or after your spa. If you're planning on making a weekend of it, maybe for a spa retreat with the girls, book a spa break for just £99 each and indulge in a relaxing night while you and your friends get pampered and showered in luxury, celebrity style. For more deals on spa breaks and spa packages check out our Malmaison deals page where you’ll find all the latest promotions and money saving voucher codes. Early or late check out isn’t always available but if you contact Malmaison they will be able to let you know for sure. Do you offer parking at your hotels? Please see your chosen hotel for directions and local parking information including charges, or contact the hotel directly. Extra beds can be booked in advance at an additional cost of £30. Cots are supplied free of charge but must be booked in advance of arrival. Guests are welcome to bring their pets to stay at Malmaison. However, they request that you please notify them during the booking process or in advance of arrival. The Malmaison chain includes a list of luxury, boutique hotels in twelve hand picked city locations throughout the UK. As well as great accommodation Malmaison also have a first rate restaurant and a variety of brasseries that offer contemporary dining in welcoming surroundings. If you're planning a stay in one of these superb hotels make sure to grab a Malmaison voucher code from us and save yourself some money on your trip. You can even find fantastic offers and deals on dining options to make your time away less expensive than you first thought. 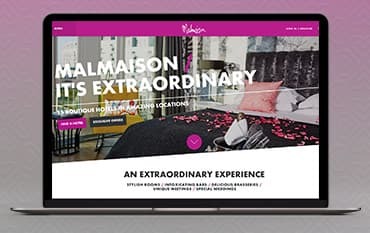 We are constantly on the hunt for Promo Codes for Malmaison to help you with your money saving. Our experts check dozens of sites for secret codes including NHS discounts, student sites & social media channels saving you time & money!